Apple took the wraps off of its latest watchOS, introducing major changes to the operating system including a greatly improved Workouts app, as well as an upgraded Siri experience. "We're thrilled with the positive impact Apple Watch is having on people's lives," said Jeff Williams, Apple's chief operating officer, said in the announcement. "Apple Watch is helping our customers stay connected, enhance their fitness and, in many cases, detect life-threatening conditions. With the launch of watchOS 5, we're excited to introduce new activity and communications features that will take the Watch to a whole new level." According to Apple Vice President of Technology Kevin Lynch, who conducted the main watchOS demo, Apple has collected 6TB of data from 12,000 participants who logged 9000 hours and 2.3 million calories of biometric information. Lynch called it the largest biometric data collection of its kind. WatchOS 5 allows users to challenge any of their contacts to a 7-day activity competition, with progress updates given to all of the participants and even awards for winners. Apple demonstrator Jules performed a demo while on an exercise bike. 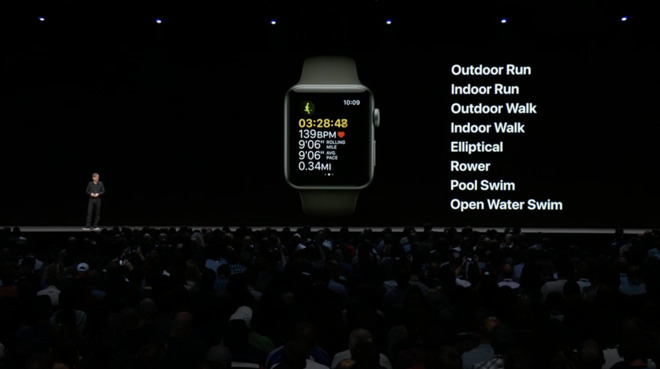 WatchOS 5 allows users to start a workout on Watch, including notifications about workout competitions, and even the ability to plan a celebratory dinner, and even talk to their child while working out. The features allow specific workouts related to hiking, yoga and 12 other activities, as well as outdoor runs with pace alerts. It even offers automatic workout detection, in addition to stress detection if Apple Watch determines the user has stopped. 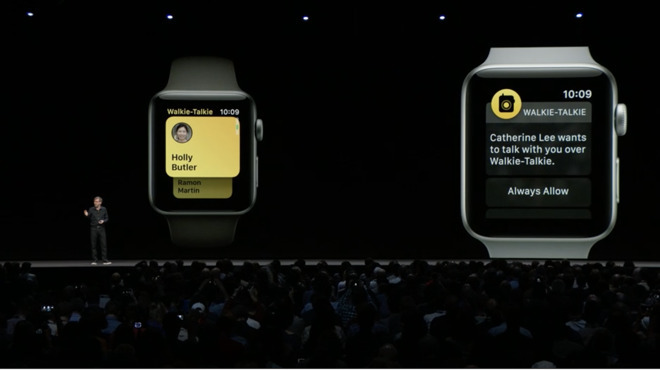 Another new feature is "Walkie-Talkie," which is exactly what it sounds like — allowing Apple Watch users to communicate with one another as if one is using a push-to-talk walkie talkie. It works over cellular or Wi-Fi. watchOS 5 now allows third party apps on the Siri watch face, including those from Nike. The operating system now no longer requires verbalizing of, "Hey, Siri," to trigger Siri on the Apple Watch. Instead, the virtual assistant can be called upon simply with a raise of the wrist. Notifications are now more intuitive in watchOS 5. Users can respond more easily to notifications, such as adjusting a dinner reservation via Yelp. Also, message notifications are improved, through integration of WebKit with watchOS. Adding to the previous Apple Music integration. Now, Apple Podcasts has been added to the Watch as well. Users can also ask Siri on Watch to play individual podcasts. In addition, third party apps are able to play background audio. A wide variety of other features are on the way for the Apple Watch, including the ability to integrate student IDs with the Watch. These will launch this fall at a handful of universities, including Tim Cook's alma mater Duke, the University of Alabama and the University of Oklahoma. And in honor of Pride Month, Apple is offering a special rainbow-colored Apple Watch band, which is available now. It appears watchOS 5 will mark the end of extended software support for the first-generation Apple Watch, as the beta is not compatible with the legacy device.